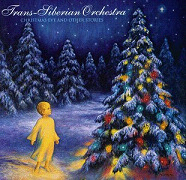 Let's get this clear from the beginning- The Trans-Siberian Orchestra comes from Savatage and oddly enough there are still some people who are not aware of this as the origin point of the group. The signature piece of this Metal Ensemble entitled "Christmas Eve Sarajevo" first appeared on the Savatage CD Dead Winter Dead. The tune stood out on the CD back then and also received a large amount of airplay on stations that would never play the music of Savatage in the first place. The music of 1996 was very steeped in the "alternative" movement and hard rock music was seldom heard and looked to die a quiet death. Clearly this track would prove another road could be taken with heavy music. The players on this piece include Chris Caffery, Jeff Plate, Al Pitrelli, Johnny Lee Middleton, Zak Stevens and Jon Oliva (who are all from Savatage on guitars, drums, bass, keys and vocals respectively). In addition to these metal stalwarts are co-creator Bob Kinkel (keys) and Tom Farese as one of the main vocal leads. There are at least another dozen or so singers that I have left off this writing. Most of these folks listed make up the East Coast Company of the touring entity that the group becomes each year. Since the story that the music is based upon is by Paul O'Neill (a long time contributor to some Savatage material as well as co-creator of the Trans-Siberian Orchestra) the booklet that accompanies the piece includes the full tale and all the lyrics to these often very powerful tunes. The story is quite simple. It tells of an Angel on a mission from God on his visit to Earth at Christmas time. It follows his journey and tells of the people and things he comes in contact with. Very effective�.it works! I usually will glance over the booklets on CD's for a minute or two, but in this case I had found myself referring to it each and every time the music begins. Those who see them live can agree that it helps to do this as a prep to the shows. The group will perform this CD practically in its entirety at each show for the Holiday Season. Since this release the TSO (as they are lovingly referred to by fans) have released two more Christmas CD's (The Christmas Attic and most recently The Lost Christmas Eve) as well as one non -Holiday presentation called Beethoven's Last Night. However, the first one remains the fan favorite and is a very tough piece to follow up on or surpass with any ease. This CD comes with the highest of recommendations from me as I view it as a work of genius. There are so many powerful moments on it, and while you might play it for one number or two you will often find yourself listening to the entire piece. Alongside of the many instrumentals of which I find so many favorites, there are some stand out vocal numbers. Among these "Ornament" and "Old City Bar" which actually work together in the story. Who should buy this item? Well, anyone who likes a great piece of music for the Holiday Season, and is a fan of great storytelling. I have loved the piece for years now, and it never gets stale. Enjoy.